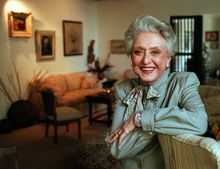 NEW YORK (AP) — Celeste Holm, a versatile, bright-eyed blonde who soared to Broadway fame in "Oklahoma!" and won an Oscar in "Gentleman's Agreement" but whose last years were filled with financial difficulty and estrangement from her sons, died Sunday, a relative said. She was 95. Holm had been hospitalized about two weeks ago with dehydration. She asked her husband on Friday to bring her home and spent her final days with her husband, Frank Basile, and other relatives and close friends by her side, said Amy Phillips, a great-niece of Holm's who answered the phone at Holm's apartment on Sunday. She won the Academy Award in 1947 for best supporting actress for her performance in "Gentlemen's Agreement" and received Oscar nominations for "Come to the Stable" (1949) and "All About Eve" (1950). But late in her life she was caught up in a bitter, multi-year legal family battle that pitted her two sons against her and her fifth husband — former waiter Basile, whom she married in 2004 and was more than 45 years her junior. The court fight over investments and inheritance wiped away much of her savings and left her dependent on Social Security. The actress and her sons no longer spoke, and she was sued for overdue maintenance and legal fees on her Manhattan apartment. In 1979 she was knighted by King Olav of Norway. In the 1990s, Holm and Gerald McRainey starred in CBS TV's "Promised Land," a spinoff of "Touched by an Angel." In 1995, she joined such stars as Tony Randall and Jerry Stiller to lobby for state funding for the arts in Albany, New York. Her last big screen role was as Brendan Fraser's grandmother in the romance "Still Breathing." During her fourth marriage, to actor Robert Wesley Addy, whom she married in 1966, the two appeared together on stage when they could. In the mid-1960s, when neither had a project going, they put together a two person show called "Interplay — An Evening of Theater-in-Concert" that toured the United States and was sent abroad by the State Department. Addy died in 1996. Funeral arrangements for Holm haven't been made. The family is asking that any memorial donations be made to UNICEF, Arts Horizons or to The Lillian Booth Actors Home of The Actors Fund in Englewood, New Jersey.